When much of the world is busy celebrating Christmas, what will you and your Jewish family do? How about inviting other Jewish families over for a Chinese potluck meal? These kosher Chinese recipes can help you to quickly and easily prepare a kosher Chinese-style meal for your family and friends. The Shabbos before Christmas, freeze 4-8 cups of your Jewish chicken soup broth. Then on Christmas eve, invite your Jewish friends over for a potluck Chinese dinner. 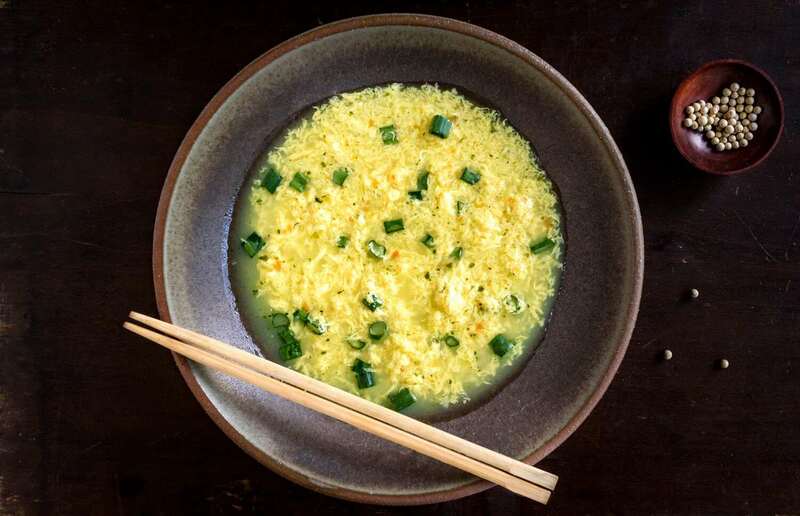 It is very easy to make Egg Drop Soup from your chicken soup stock. Who doesn't love a stir-fry? This Tofu-Vegetable Stir-Fry enables you to serve a protein that even the vegetarians in your home can enjoy. Serve this stir-fry with rice for a colorful and healthy kosher dinner. Looking for a fun activity for your Jewish family this Christmas? You can invite other Jewish families over for a Chinese potluck meal, and this Chicken Broccoli Stir-Fry can play a starring role on the menu. This Chicken Broccoli Cashew Stir-Fry recipe is loosely based on a recipe of Yisrael Aharoni, a famous Israeli chef who has written cookbooks and hosts cooking shows that teach Israelis how to easily prepare gourmet food. Marinate the chicken in oil, honey and peanut butter, and then stir-fry it for 5 minutes. Blanch the broccoli. And then simply mix together the stir-fried chicken, blanched broccoli and roasted cashews. Serve this delicious meat stir-fry over white rice for a complete meal. This easy baked Sweet and Sour Chicken recipe offers the great taste of Chinese food without all the patchy-matchy of chopping and stir-frying. Simply bake the chicken, and cover with a sweet and sour sauce consisting of onions, bell peppers, pineapple chunks and duck sauce. This Beef and Onion Stir-Fry is surprisingly easy. And what could be more tasty than beef with onions? Add variety to your Kosher Chinese meal with this meat stir-fry dish. This Fried Rice is my family's latest favorite dinner. It contains everything needed for dinner in one dish -- carbs from rice, protein from eggs, and nutrients from vegetables. We often change the vegies in the dish according to what we have on hand. And best of all when it comes to dinner prep, this delicious rice dish is easier to prepare then you would expect. What better ending to a kosher Chinese meal than fried bananas. Just dip the banana pieces in a pancake-like batter and fry in hot oil. Serve the fried bananas in a sweet syrup or ice cream for a unique and tasty dessert. Have You Tried Vegan Cashew Fried Rice?